Martial Arts, Embodiment and Transformation: What Do We Know? 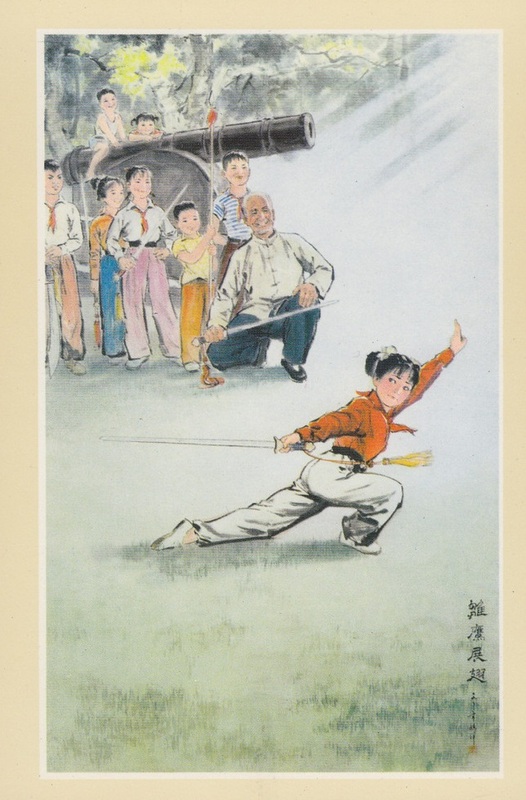 Chinese post card showing a young girl studying a sword routine as her teacher looks on. Alex Channon and George Jennings. 2014. “Exploring Embodiment through Martial Arts and Combat Sports: A Review of Empirical Research.” Sport in Society (February). Introduction: Why study embodiment in the Asian martial arts? One of the major trends that we have seen in the academic literature on the martial arts over the last decade has been a growing appreciation for the more subjective side of these practices. From the 1970s to roughly the late 1990s most serious investigations focused on topics like historical origins, institutional structure and transnational migration. All of these subjects are open to empirical examination and can be studied without much reference to the actual practices, feelings and transformations of individual martial artists. The more recent literature has broadened its focus. 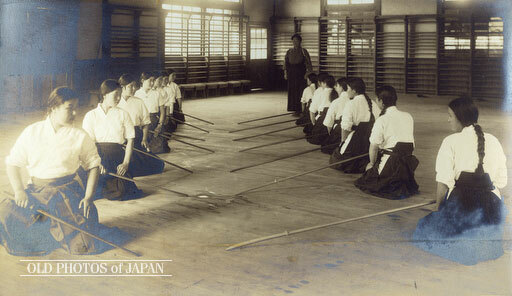 Historical and ethnographic investigations of the martial arts are still being produced. Their sophistication and quality has even improved dramatically over the decades. Yet increasingly researchers are confronting a more subtle set of questions. Do the martial arts actually function as a vehicle for the types of personal transformation which they promise? How can we understand these systems as part of a larger cultural process? And how do they reproduce these cultural and social identities in the lives of actual practitioners? In an era when “traditional” Asian fighting practices have spread around the globe, do they challenge the ways in which individuals understand race, gender and ethnicity? Or are they actually reinforcing the existing system of values and hierarchies? Much of this discussion has come to focus on the topic of martial arts as an “embodied” process. When approached from this perspective, scholars are most interested in how the practice of these fighting systems affects the actual lives of students as well as their interactions with other cultural and social institutions. The recent popularity of “performance ethnography” as a research methodology seems to be due, at least in part, to the rise of interest in these specific questions. We have already discussed a number of works which approach martial studies from this perspective. Readers might be interested in reviewing our previous post on Adam D. Frank’s volume Taijiquan and the Search for the Little Old Chinese Man: Understanding identity through the martial arts (Palgrave 2006). More recently D. S. Farrer and John Whalen-Bridge assembled an important edited volume titled, Martial Arts as Embodied Knowledge: Asian Traditions in a Transnational World (SUNY 2011), which showcased some of the best examples of this methodological approach. Given the rapid expansion of this section of the literature, it might be useful to step back and asses the field’s progress over the last decade. Alex Channon (University of Greenwich) and George Jennings (Universidad YMCA, Mexico City) have offered us a wonderful opportunity to do exactly this. Any serious student of martial studies will want to sit down and carefully study their discussion of the current state of the literature. The first thing that the reader will notice is the sheer size of the bibliography that the authors have assembled. Most of us have our own fields of specialization within martial studies, demarcated either by research area, methodology or discipline. With professional commitments it can be a challenge to find the time to review the literature more broadly. Yet it is certainly the case that our own research could often benefit from seeing how other scholars working in related areas are attempting to tackle similar issues. Obviously this is the great benefit of any sort of literature review. It allows a reader to situate his or her own thinking against the larger field of academic inquiry. It provides students with a road map of recent developments and points out articles and discussions to pay attention to that one might not otherwise come in contact with. Next they describe the development of their area of the literature by discovering the basic research questions and conversations that are organizing debate within the field. Lastly, it is the authors’ responsibility to offer a critical assessment of the state of the literature and to suggest some avenues for future development. Channon and Jennings’ review is valuable, and highly recommended, precisely because it fulfills each of these core functions clearly and with skill. Yet in some ways it is the timing of this article that makes it especially critical. Looking at their review of the literature it is obvious that the field of martial studies is no longer “in development.” It is a project that is already here. In fact, it has been here for some time. Better still, this project appears to be building up momentum. More authors are entering the fray (enough that one needs periodic literature reviews to keep track of them) and they are opening exciting new research areas. Still, it is also clear that our understanding of what “martial studies” is, and what it should become in the future, is evolving. As a result Channon and Jennings’ recommendations are occurring at a time when they could have an actual impact on the development of the field. And while many of their proposals are quite sensible, there are some other aspects of how they understand this literature that may require deeper study. Naganita Class. Okayama City, 1935. Source: Old Japan Photos. Understanding the Martial Arts as Embodied Experience: The State of the Literature. Given the sheer scope of the literature that the authors have been asked to characterize, this review is very straightforward and easy to read. In short, it succeeds in its central task of providing a road-map of recent developments. Students from many different areas of martial studies will find something interesting or informative in these pages. After a few brief introductory remarks the authors note that most of the investigations in the literature seem to revolve around four distinct topics. These are 1) the role of the martial arts in transmitting certain “body cultures” 2) their function as unique pedagogies or teaching philosophies for passing on various bodily disciplines 3) questions about how the martial arts interact with the construction of gender 4) the issue of bodily harm (pain and danger) in our understanding of the martial arts. These basic themes seem to transcend many of our more specific research questions. They reoccur in areas as diverse as the development of Japanese swordsmanship, understanding the role of Kung Fu within immigrant communities, or attempting to understand MMA popularity in the US and Japan. Each of these basic themes structures one of the four main sections of the authors’ review. In each instance they begin by breaking the topic down into some of its component issues. For instance, when we consider the question of “body culture” we are confronted with a number of possibilities. How are the martial arts used to convey national or ethnic identity? How have they been appropriated or exploited through the process of global transmission? In each of these subsections the authors introduce and briefly comment upon a number of different studies. They may be articles, edited chapters, book length studies or doctoral dissertations. Nor did Channon and Jennings restrict their study to a single discipline. Instead they drew widely from the literature on the sociology of sports, sports education, the social sciences, psychology, anthropology and some aspects of area studies. Still, certain types of work were excluded from their review. As one might have noticed when reading the subtitle of this article, their emphasis focuses on “empirical” studies of the martial arts rather than “interpretive” ones. This is an interesting choice as there has been an explosion of interpretive work on these themes in recent years. The other interesting theoretical contribution of this article was the authors’ development of the term MACS, meaning “Martial Arts and Combat Sport,” as their explicit object of study. They began, quite rightly, by noting that the term “martial art” is under theorized in the current literature. It can mean a very wide (and often contradictory) variety of things depending on who is using the name and in what context. Rather than attempting to sort out this dilemma, the authors advanced the idea of the “MACS” as a more expansive definition of a set of physical practices surrounding the topics of violence, training and healing. Thus martial sports, traditional martial arts, and military or police practices that are taught in a social setting might all fall under this umbrella term. Ultimately we still need to think about and shore up some of the key concepts within the field of the martial studies. Still, I thought that the idea of the MACS as a conceptual category was an elegant solution which other authors might find helpful when trying to bring some of the more disparate aspects of the literature into a single discussion. Given that this review article is relatively brief and straight forward, there is no reason to summarize Channon and Jennings’ conclusions for each of the four major branches of the field. Interested readers are encouraged to click on the link at the top of this post and study their findings for themselves. Instead I would like to turn to their overall assessment of the state of the literature and their suggestions for future research. Within the topic of “body culture” the researchers found that most studies seemed to focus on single culture environments. They noted that there is a greater need for research on the role of the MACS in multicultural societies and among immigrant and minority populations. The least developed section of the literature seemed to be that dealing with the pedagogy of the traditional martial arts. Here they called for studies that did a better job in balancing theoretical, empirical and practical/political variables. In their view, our understanding of both gender and violence in the MACS could be augmented with increased research into the role of the mass media and the response of fans to both combat sports and representations of traditional martial arts. Additionally they noted that while questions of embodiment and sexuality have gained prominence in the broader literature on the sociology of sports, they have barely been touched in martial studies. The dual questions of change and globalization also arose in their final conclusions. They noted that it may be time to reassess the goals and motivations of individuals within the various MACS as they related to self-defense, cultural tradition and sporting competition so that we can keep a more up to date understanding of the social meaning of these various practices. Lastly they argued that there was more room for studies focusing on institutional and structural factors (such as economic change and globalization) with regard to the transformation and hybridization of certain body cultures. Female student studying Wushu in a scene from Inigo Westmeier’s Dragon Girls. In the final section of this post I would like to go back and consider some of the broader theoretical questions which this article raises about the current state of the literature. To begin with, I was a little surprised to read some of the authors’ suggestions of where the literature could use additional study and theoretical development. After all, there already seem to be a number of interesting studies on the role of the mass media in promoting certain views of gender, violence and ethnicity in the martial arts. And it is not hard to point to studies on the experience of the martial arts in multicultural societies. I have reviewed a number of them here at Kung Fu Tea. So what exactly is going on? The basic issue comes down to how the authors have defined the scope of the relevant literature, and in a more subtle way, what they have implied about the boundaries of the field. As I mentioned before, literature reviews don’t just describe all of the recent that has been done on a topic. They also offer an either implicit or explicit assessment of what “good work” looks like and where exactly the boundaries of the disciplinary conversation lay. Nor are these two tasks mutually exclusive. In fact they are quite closely linked. Thus when assessing a literature review it is just as important to consider what has been excluded from the conversation as what has been included. My first reaction was to note that many of the items that the authors wished to see discussed had been addressed (sometimes quite well) in the various chapters of Farrer and Whallen-Bridges 2011 volume Martial Arts as Embodied Knowledge: Asian traditions in a transnational world. Given that this is a recent university press volume dedicated exclusively to authors’ topic of interest, one would have expected it to play an important role in this review. It did not. Aside from a single cursory mention in their introduction, neither this volume nor the studies offered by its authors are ever mentioned. Channon and Jennings are admirably upfront about what they are excluding and why. This is actually somewhat refreshing as not all literature reviews are. Specifically, they state that they have sought to restrict their work to empirical studies of the actual embodied experiences of martial artists and as a result they decided to exclude the more “interpretive” and “critical” contributions of cultural theorists and media scholars. The crux of the issue is that Farrer and Whalen-Bridge (who have done as much old-school ethnographic research as anyone else in field) argue that this division is artificial and hard to maintain. In fact, their work was a conscious attempt to bridge this divide. So in excluding these arguments Channon and Jennings were not simply following the obvious and unquestioned contours of the field. They were in effect advancing their own argument about the proper shape of the literature and what constitutes research “worthy” of engagement. In some ways the picture of martial studies that Channon and Jennings paint is remarkably interdisciplinary. Ethnographic and sociological studies sit comfortably next to discussions of what role martial arts instruction should play in the development of grade school physical education curriculum. By while they have shown themselves willing to reach across disciplinary lines, their approach to theory seems a bit more conservative. As I have mentioned before, my training is in the field of political science where I studied political economy. It is hard to think of a more empirically driven subject than trade protection and the impact on imports and exports on regional economies. Clearly I believe in social scientific theory as a means of creating understanding. And I will admit to being a bit concerned at times that the debates between the historians and anthropologists within the field of martial studies might squeeze out some of the sorts of research that I am most interested in seeing. As such I really appreciated the degree to which Channon and Jennings were able to bring some of these social-scientific voices back into the discussion. Nevertheless, I cannot help but see their exclusion of the “interpretive” side of this conversation as a lost opportunity. Setting aside the ugliness of the philosophical and methodological wars that have torn apart so many fields and departments apart over the last few decades, I my view there is no good reason why these approaches cannot work with each other in an interdisciplinary setting. It is important to acknowledge that empirical and interpretive studies both have their own assumptions and methods that may not always be compatible. But that probably is not the best way to define or limit an emerging interdisciplinary research area. Critical theory often suggests issues and dimensions of social conflict that more traditionally trained historians might not otherwise have considered searching for in the historical record. Likewise empirical scholars can bring to light personal and social narratives that might otherwise be lost. These can provide interpretive scholars with the resources that they need to better develop and assess their various critical theories. There are lots of areas of academic inquiry that benefit from this sort of engagement. What students of martial studies need to bear in mind is that at the end of the day our subject of interest is basically a branch of popular culture. That fact does not change regardless of whether you are interested in Kung Fu in Guangzhou in 1910 or MMA in London in 2010. Given the sorts of questions and limitations that inevitably arise in the study of popular culture, it is hard to imagine a subject where the combined forces of these two approaches are not more necessary. This is not simply an abstract academic debate. It is actually a critical issue for anyone interested in the future development of martial studies. These methodological questions have very important implications for how we approach routine historical and ethnographic investigations, particularly as they pertain to the question of “embodied knowledge” in the martial arts. Cannon and Jennings mentioned that they would like to see more research on the role of MACS in multi-ethnic societies. I would suggest that a great place to start would be D. S. Farrer’s chapter entitled “Coffee Shop Gods: Chinese Martial Arts and the Singapore Diaspora” in Farrer and Whalen-Bridge (eds) Martial Arts as Embodied Knowledge. This essay was the result of multiple years of participant ethnography conducted with Singapore’s Jingwu (Pure Martial) Association and as well as a local Choy Li Fut sect. Throughout the course of his research Farrer explored how the memorization and discussion of large numbers of Kung Fu forms enabled master to become repositories of China’s traditional “cultural capital.” By passing on these forms they were able to effectively “create memories” of what it meant to be Chinese within their students. All of this was happening within Singapore’s fragmented and racially obsessed cityscape. In short, this is exactly the sort of qualitative study that one would expect Channon and Jennings to find most interesting. It is also interesting to note that while Farrer and Whalen-Bridge discussed the importance of media and interpretation in their introductory remarks to the edited volume, these were not really concerns that received much attention in Farrer’s own chapter. Instead he focused on the physical aspects on how various martial artists remembered, performed and passed on their body of knowledge. Yet what very quickly becomes apparent in reading Farrer is that the actual physical experience of performing some routine in the martial arts is not self-interpreting. Both Farrer and the authors of the current study are interested in the question of embodied practice and transformation. Transformation inevitable depends on one’s social status, and that in turn reminds us that no individual is born as a blank slate. Our identity, the thing that we feel most directly within our own body, is always conditioned by how others see us. It is a product of the social discourses that we are involved with. But how did young people learn about Wu Song in the first place? It actually wasn’t from their Kung Fu teachers. Instead it was from movies and television programs. The story of Wu Song was passed back and forth on DVDs and in books. For an older generation opera performances and radio dramatizations likely filled the same role. Clearly the mass media has an important impact on the martial arts in both Asia and the west. The release of a successful film will not only drive a wave of students towards a style, but it will structure their expectations and understanding of the art. These impressions both frame and condition what a student subjectively experiences when they then take on an embodied martial style. In actual practice I am not so sure that this is ever the case. I suspect that an entire generation of teenagers in Hong Kong were deeply affected the Wong Fei Hung movies that they saw in the 1950s and 1960s. This glamorized, and highly conservative, vision of the past was full of culturally important messages that told these students who they were and suggested to them the many ways in which the study of Kung Fu would reinforce this identity. But this vision of the martial arts was also very different from the actual lived experience of practitioners who had come of age in the 1920s and 1930s. Real teachers may have passed on specific body practices, but we are deceiving ourselves if we assume that that Wong Fei Hung, or the many martial heroes of Jing Yong’s highly popular novels, had no role in framing how they would be understood or how the transformational process would evolve. In short, if we are serious about understanding the embodied experiences of different generations of martial artists we must remember that physical sensations are not self-interpreting. They derive their meaning from where they stand in relation to other elements of popular culture. This is not surprising. Anthropologists tell us that rites of passage usually include both a ritual and a mythic component. Rather than arguing about which is prior, we should instead be focused on how the two come together to create powerful symbolic talisman of transformation within the body of the martial arts practitioner. The insights of cultural theorists may yet play a role in answering many of the questions that Channon and Jennings point to. If you enjoyed this you might also want to read: Yim Wing Chun and Gender: The Stories of Ip Man and Yuen Woo Ping in a Comparative Perspective.